In this episode of Soapopera Meets we fly to New York City to chat with Nadia Azmy. Nadia is an Egyptian-rooted creative wonder girl who is toppling unfounded stereotypes one instastory at a time. 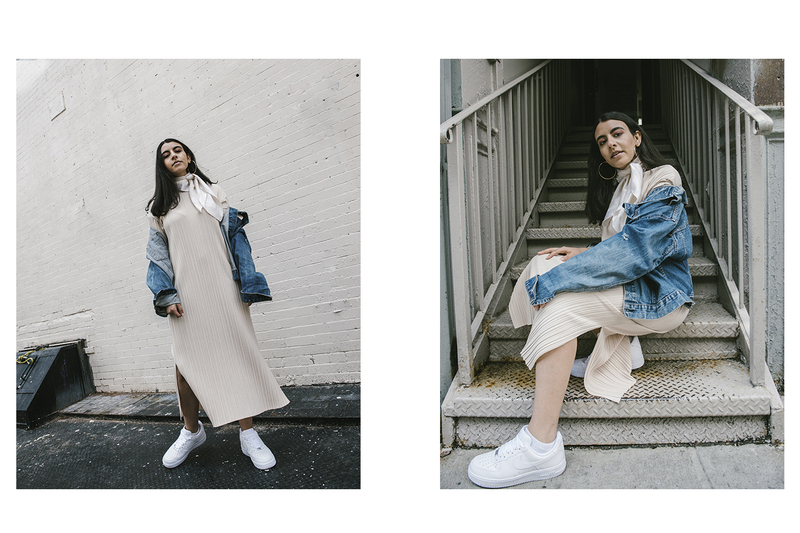 Armed with a Parsons education and an ally and bff in Middle eastern girlboss Alaa Balkhy, Nadia’s creativity is tangible within her joyous and positive personality. Her passion and general happiness were contagious as her and I exchanged DMs and emails, making it impossible for me to not find a friend in the process. To get to know her, read our conversation below! Naomi. What’s your name and who are you? Nadia. My name is Nadia Azmy, I’m 25 years old and I am an Egyptian American art director living in New York City. Naomi. How long have you been living in New York? What brought and made you stay here? Nadia. I am currently coming up on living in New York City for two years! I was working at a doctor’s office as a receptionist while blogging on the side, and always knew I was passionate about design. One day I received my pay check and applied to two design schools. Later that summer, I was in Egypt when I received my acceptance to Parsons! Two years later and I’m here working my dream job and on projects I love! Naomi. You’re an art director, but obviously you are a 360 creative person. What would you describe your “job” like? Nadia. I am constantly searching for inspiration and implementing inspiring visuals to my style, my work and the projects that I am most passionate about. Naomi. Does being a woman & Arab affect your job in any way? We hear everyday stories on this topic in today’s America, however I would love to hear about how you juggle your way around it – if needed. Nadia. Not at all! Especially in New York City. NYC is such a diverse city! If anything, being Arab has given me opportunities to share my experiences and express my culture. Naomi. You are very active and outspoken on social media, especially when it comes to empowering Arab women and women in general. What inspires you to do this? Have you ever received negative feedback from your followers? Nadia. I truly believe that each individual should have the power to express themselves as they would like. It is their right. Nothing upsets me more than seeing women, or anyone, being shunned for expressing themselves. Because I grew in up a digital age, many of my personal decisions were publicized, because that is the reality of social media. When I had made the decision to remove the headscarf (hijab), people of the online community felt entitled to comment on my decision. This is really what drove me to be more outspoken about my personal expression as well as encouraging other women to live their life freely without regrets or fear of judgement. Naomi. Tell us about Minaazine. How did the project come about, what’s your relationship with it, what is the goal and how hard is it to keep it up? Nadia. So MINAAZINE actually has a really interesting backstory to it and it begins with the way my cofounder, Alaa Balkhy and I, met. We initially connected on social media from different parts of the globe and ended up becoming best friends. We were both aware of the power of social media and the endless possibilities of connecting with so many people like ourselves. It was this that lead us to strive to cultivate creative talent and culture through an inclusive online community. It’s very important for us to make sure that everyone that is included feels safe and welcome. Naomi. Does Minaazine help you keep connected to your roots? Nadia. Absolutely! I have never been more passionate or interested in getting to know and explore the Middle East and North Africa. The cultures of the region are so rich and have really inspired my personal work. Naomi. How do you see this project developing? Nadia. We are really hoping to create an inspiring community of individuals from around the globe that share the same backgrounds while celebrating the differences in their stories. Hopefully this community will also defy common stereotypes attributed to the youth in the region. Naomi. As we know, you are part of The Wing. The women-only work & community space brought to life with the aim to give the women of New York – and not only – a place to nurture their brain, meet and discuss and be empowered or rest. Can you tell us about your experience at The Wing and how does it fit in your day to day life? Nadia. The Wing has really inspired our MINAAZINE project. Seeing so many women from all different backgrounds connecting on their experiences as women has really been enlightening for us. The Wing has so many events that help you connect with other Wing women while also providing the space to grow personally and professionally through events such as panels and Wing Women Speed Dates. Not to mention, it’s the most instagrammable space I have ever laid eyes on…. Naomi. Are you an active contributor of The Wing or do you only use it as a place to be inspired and breathe the same air of other phenomenal women? Nadia. I currently participate at The Wing as a member. It’s really a space that inspires me every time I’m there — from the interior design, the women I’ve met and the valuable events. Naomi. What is your favorite thing about The Wing? Nadia. I’ve always appreciated the feeling of community and The Wing really goes above and beyond to praise diversity. Naomi. Do you see a MINAAZINE x The Wing collab happening? Nadia. Strong, independent, and empowering women! Naomi. Name 3 of your favorite women that you dream to work with. Nadia. Yasmin Sewell, Mindy Kaling and Solange Knowles! Naomi. Lastly, what has living in New York taught you about yourself? Nadia. To to be fearless, unapologetic, and to step away from anything that doesn’t serve you. Meet Nadia here and MinaaZine here!